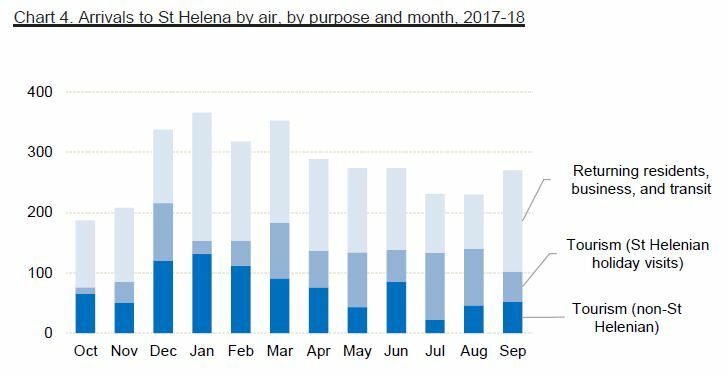 The focus of this Statistical Bulletin is arrivals and departures to and from St Helena, especially by air; St Helena’s first regular scheduled air service began more than a year ago on October 14, 2017. The primary source for the statistics in this release are records collected by the Immigration Office of the Police Directorate for arrivals and departures, and the Customer Service Centre at the Post Office for births and deaths. A full set of statistics and indicators can be downloaded in Excel format from the ‘Population’ file on the St Helena Statistics website at: www.sainthelena.gov.sh/statistics-data. People arrive on St Helena either by ship, by yacht, and – since the construction of St Helena’s airport in 2016 – by air (note that day visitors from cruise ships are not included in statistics on passenger arrivals, although they are included in Table 1 for completeness). For the one year period October 2017 to September 2018, excluding cruise ship passengers, 5,235 people arrived at St Helena altogether. This is a record number of arrivals in recent times; the next highest number since 2010 was 4,205 in 2014/15, for the same October to September period. 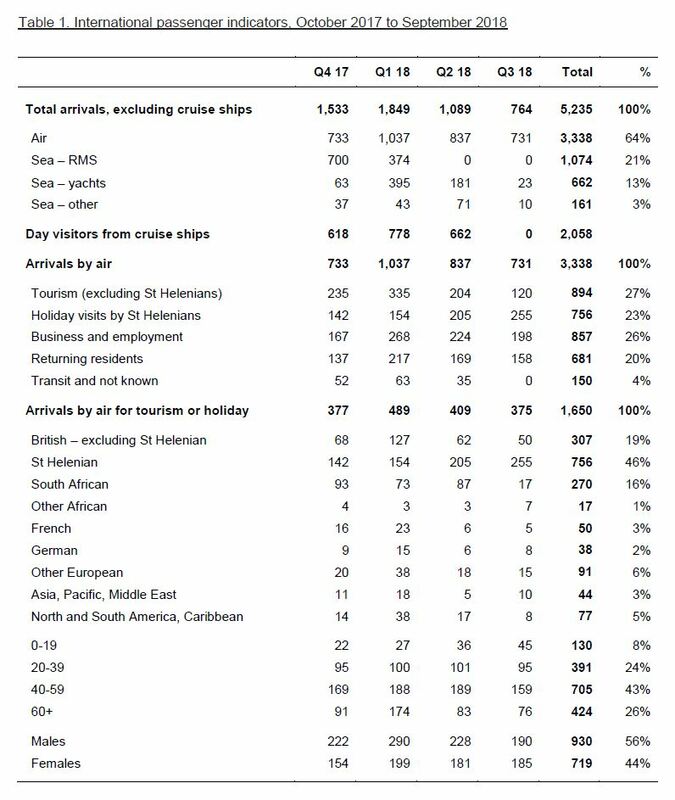 Until 2018, most arrivals by sea have been by ship, on the RMS St Helena (following withdrawal of the RMS St Helena from service in February 2018, most arrivals by sea are by yacht). Chart 2 compares the average monthly arrivals on the RMS St Helena between 2010 and 2017 with monthly arrivals by air over the past year. Apart from the first three months of the new commercial air service, when the RMS St Helena was also still in service, arrivals by air have been higher. There is a clear seasonal pattern of arrivals around the Christmas months of December and January, but it is less pronounced for air arrivals compared to arrivals by the RMS St Helena. The purpose of visit of all persons arriving on St Helena has been classified as either returning resident, business, tourism/holiday, or in transit. Within tourism/holiday, there are two groups: St Helenians who usually live abroad but who return for short periods typically to visit family and friends, and other nationalities (i.e. non-St Helenians). Around half of all arrivals by air were for tourism or holiday (1,650 people or 49%) and just under half were arrivals of returning residents or those coming for business or employment (1,538, or 46%). It should be noted that these figures do not include a full year of commercial air operations because the service started in the middle of October; for a full year (365 days) of commercial flights, the first two flights of October 2018 would need to be added. Chart 4 illustrates arrivals by air by month; the typical seasonal pattern of non-St Helenian tourists is quite pronounced, but the pattern of St Helenians arriving for holiday visits over the past year by air has been quite different, with the most popular month being July. This coincides with the UK summer holiday season, but it is also likely that many St Helenians abroad chose to use the RMS St Helena over the 17/18 Christmas period, while the service was still operating. The average length of stay has been calculated for those arriving by air for tourism or holiday purposes, and with a stay of less than six months. Only those visitors that have left are included; this helps exclude those that might arrive initially for a short period for a holiday, but who stay for much longer. Overall, during the first year of commercial air operations, most tourist/holiday visitors stayed for about a week (Chart 5). But there are differences between St Helenians and non-St Helenians: St Helenians stay much longer than other nationalities. 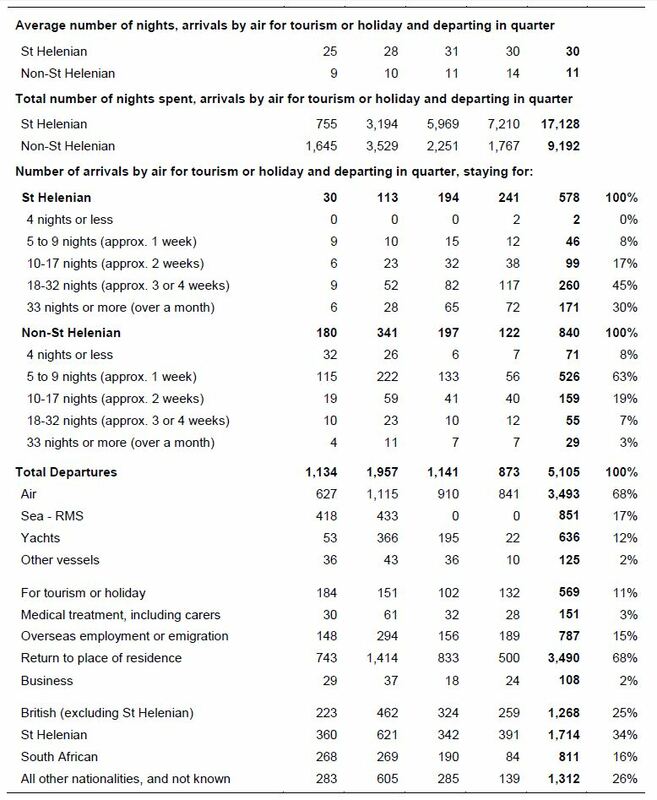 Over 70% of non-St Helenian tourists stayed for a week or less, with less than 10% staying for a month or more. But 75% of St Helenians visiting on holiday stayed longer, with less than 10% staying for a week or less. Another measure is the total number of nights spent by the different groups of visitors, calculated by adding together the length of stay of each visitor that left. 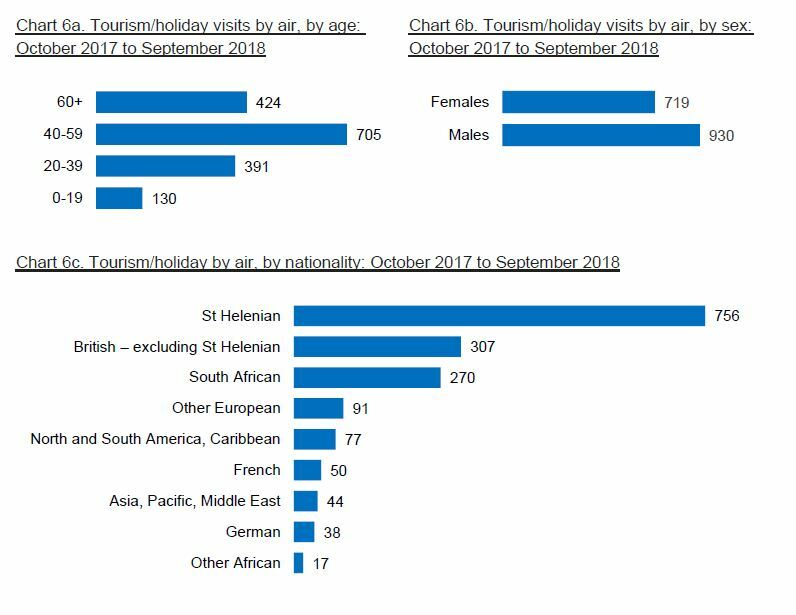 St Helenians visiting on holiday and arriving by air spent just under 17,000 nights in total on St Helena between October 2017 and September 2018, compared to just over 9,000 nights in total by non-St Helenian tourists – even though there were more arrivals of non-St Helenian tourists. This is because St Helenian visitors stayed longer, on average. From the total nights spent, it is possible to derive an average for the number of people on St Helena each night, by dividing by the number of days in the year (365). The average persons per night for those arriving by air for tourism/holiday was around 72, with 25 tourists and 47 visiting St Helenians. Like all averages, this does not measure the actual number of people on St Helena on every night of the year – on some nights, there would have been more, and some nights less. Charts 6a to 6c show various characteristics of tourism/holiday visitors that arrived by air in the last 12 months. There were slightly more men than women, and almost 70% were 40 or older. Apart from St Helenian, the most common nationalities were British, South African, and French (20%, 17% and 3% respectively). There were two births between July and September, the lowest quarterly number recorded since at least 2010. It brings the total number of births so far in 2018 to 15. There were seven deaths in the third quarter of 2018, which was also very low compared with recent trends. 33 deaths have been recorded to date in 2018 – more than double the number of births. Statistics on births and deaths are derived from records maintained by the Customer Service Centre, St Helena Post Office. Estimates of the total population are calculated by combining the number of arrivals and departures and the number of births and deaths with the estimated population from the 2016 Census. At the end of September 2018 the number of St Helenians on St Helena was estimated to be 4,282, an increase of 47 compared to August 2018 and of 228 compared to September 2017. The estimated number of persons on St Helena, residents plus visitors, was 4,539, about the same as the previous month but an increase of 99 compared to the year before. The classification of arrivals and departures into purpose of visit or departure is based on the declarations made to Immigration Officers. Tourism/holiday includes short-term visitors or departures (i.e. less than six months) for tourism or holiday purposes, and it includes St Helenians visiting short-term to see family and friends, both those that live permanently abroad and those who are away for a period of overseas employment. Day visitors arriving on cruise ships are not included in either arrivals or departures. Business and employment includes short-term and long-term arrivals who arrive for work purposes, including those employed by the St Helena Government on contract (and their families). Returning residents are people who are returning to their normal place of residence (for arrivals, this excludes those returning for the purpose of business or employment). It also includes people returning permanently from periods of overseas employment. Transit includes those for whom St Helena is not their final destination; it includes most arrivals by yacht and any people transiting to or from a ship via air. Three categories of the total population are used. The on-island population is an estimate of the total number of people on St Helena at the end of the given period (this is sometimes also referred to as the ‘de facto’ population). The resident population is an estimate of the total number of people living on St Helena (i.e. excluding any short-term visitors), regardless of their nationality. The on-island St Helenian population is an estimate of the total number of St Helenians on the island, regardless of their residence status. The Statistics Office aims to constantly improve the quality and usefulness of the statistics it produces. For this release, new series have been calculated for 2017 and earlier, to distinguish St Helenians visiting on holiday from other tourists. Two adjustments have also been to improve comparability between the statistics derived from the new data management system introduced by the Immigration Office in January 2018 and the previous system. The first adjustment is that St Helenians returning for a short term holiday visit from overseas employment have been categorised within the tourism/holiday grouping as St Helenians returning for a holiday (they had been previously categorised as returning residents). The second adjustment is that persons arriving on a yacht have been uniformly classified in the transit category, unless their destination was St Helena.